Here’s a fun outdoor activity idea that would be great for a sunny afternoon with the kids! This sidewalk suitcase was a HUGE hit with my kids when I surprised them with it after school one afternoon. It is easy and quick to put together, and it doesn’t cost a lot of money. I love how something so simple can make them so HAPPY!! The best part was watching them share it with our friends and neighbors. Yay for good old fashioned playtime fun! An Old Suitcase (a shoe box would do nicely for this too). We used cardboard suitcases for this, since they are inexpensive and can be decorated however you would like. Write “Sidewalk Suitcase” on a piece of paper and attach with a bit of masking tape to the inside lid of the suitcase. Fill your sidewalk suitcase with the goodies listed above. Feel free to make your own version — perhaps adding a jump rope or jacks , if age appropriate. 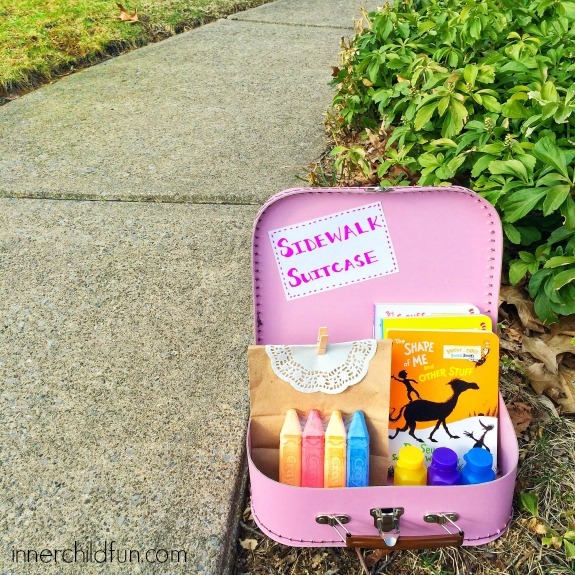 Surprise your kids with the sidewalk suitcase and inspire plenty of imaginative outdoor fun! 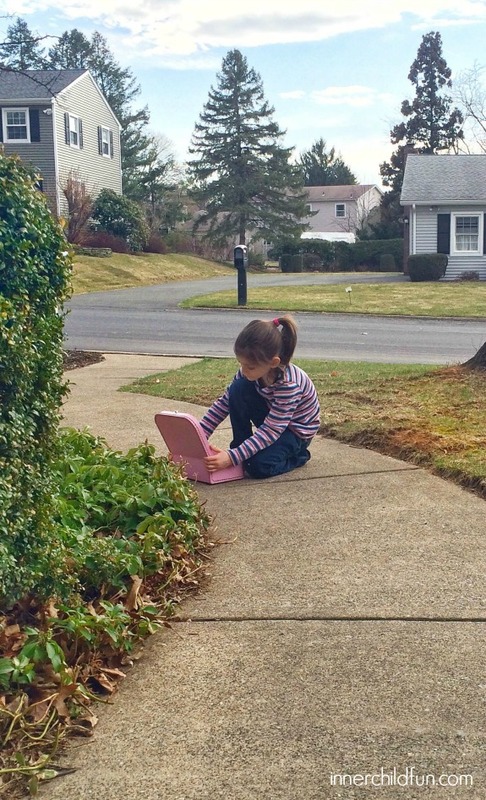 My kids loved drawing a cooktop on the sidewalk and cooking up stick stew for their stuffed animal friends. Hopscotch is always a hit! They also enjoyed blowing bubbles while wishing good things for other people. I love how this kept them happily entertained for the afternoon, and inspired lots of creative play!